In Media Controversies, Where Are the Editors? 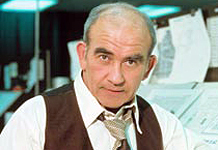 Lou Grant would not let this happen. Controversies like this crop up with regularity these days, thanks to Internet culture allowing easy forwarding and a growing chorus of media critics extra-sensitive to gender and race issues. This is a good thing, and I include myself in this chorus. I genuinely believe that this policing will go a much longer way toward helping us all understand our biases and their destructive powers than any diversity training or whatever else we’ve tried in the past. What I wonder when these things happen, though, is: Where are the editors? And I worry, just a little bit, that editors are more often apt to hang their writers out to dry in a culture where controversy converts into web traffic, and web traffic converts into ad dollars. Nothing flies around the Internet faster than an outraging piece in a major publication. People share it to fume over it, and then the nightly news and daytime talk shows use it as fodder, and then even more people visit the site to read and get upset over the piece. There are too many to count, but a few biggies in the last decade include: Christopher Hitchens’ “Why Women Aren’t Funny” in Vanity Fair in 2007; Maura Kelly’s “Should ‘Fatties’ Get a Room?” on MarieClaire.com in 2010; and Elizabeth Wurtzel’s “I Refuse to Be a Grownup” in The Atlantic in 2013. Go ahead, click on them — the damage is already done, and they are quite entertaining in their schadenfreude. The writers take the blame for their harsh words, and they should. But I worry that their editors knew they were sending their writers to the Internet dogs and said nothing. Editors are people who read copy and raise concerns and questions about it — in addition to fixing possible spelling and grammar mistakes — before it goes to print. I am not a psychic, nor am I privilege to the inner workings of these pieces, but I’m skeptical any of them raised significant concerns, or considered just not printing something damaging and absurd and counterproductive to society. In the case of the Rhimes piece, the Times‘ Public Editor Margaret Sullivan did investigate what went into the piece, including the editing. And Culture Editor Danielle Mattoon seems to be honestly copping to the failure while noting that editors should be more aware of their own “blind spots.” As for Vanity Fair in 2007, they hilariously decided to have their Hitchens and funny women too by publishing, essentially, a vague rebuttal a year later (coincidentally, written by none other than Alessandra Stanley). And don’t worry, Hitchens got to write a rebuttal of the rebuttal, so they rode that web traffic-generator as far as it could possibly go. Kelly — with whom I am friendly — may have shed the most light on these cracks, albeit inadvertently. In her original piece, she decried the then-new sitcom Mike & Molly for featuring a relationship between two characters who meet at Overeaters Anonymous: “I think I’d be grossed out if I had to watch two characters with rolls and rolls of fat kissing each other … because I’d be grossed out if I had to watch them doing anything.” After the ensuing uproar, which reached levels where the ladies of The View were attacking Kelly by name, she wrote a follow-up apologizing for her “bullying” post and mentioning her own struggle with eating disorders and body issues in her past, something she’d written extensively about, even in the very space where this blog post appeared. This is key, because it shouldn’t have taken friends and commenters to point this out to her; it should have come up in the editing process. I know it’s easy to give a blog post a quick read and then slap it up there in the name of getting through another day of generating web traffic; I’ve been there, too. But, good lord, let’s think a couple of extra seconds whenever a piece deals with race, weight, sexual orientation, gender, or, hey, anything that denigrates a certain group of people, period. That Wurtzel piece reads like a narcissist’s ode to her own adorable quirks, like a Train song to herself. Maybe that’s where exploiting writers’ blind spots becomes totally okay, a win-win for everyone. Most of us, however, are not Wurtzel, and we could use a friendly editor to save us from ourselves.